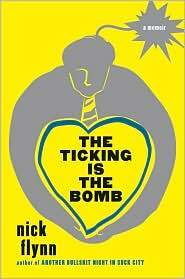 Some of the most compelling memoirs don’t follow the rules–I’m thinking of Nick Flynn’s The Ticking is the Bomb, which I read in one great gulp yesterday. Flynn’s narrative may be episodic, but he leads you straight to the heart of his life and the things that make him tick–and burn. While Flynn is waiting for his first child to be born, the photos of torture committed at Abu Ghraib prison are released. The book explores the coexistence of these two events, which define the heaven and hell of human behavior. His daughter Lulu brings redemptive love into his life, a fresh start, a chance for a stable family life to follow from his own shattering history. The Abu Ghraib photos, with their mockery of human interaction bring out a white-hot passion in Flynn. He goes to Istanbul with a group of lawyers and artists who interview Abu Ghraib survivors and collect their testimonies. In this riveting memoir, we do learn about Flynn’s childhood, his struggles with drugs, alcohol, and relationships, but those facts are not the point, or, they’re only part of the point. Flynn’s short chapters fly off the page at the reader, forcing us to make connections between the ordinary and the unthinkable. Jennifer Brice. Unlearning to Fly University of Nebraska Press, 2007. Michael Greenberg. Beg, Borrow, Steal: A Writer’s Life. Other Press, 2009. Floyd Skloot. In the Shadow of Memory. Bison Books, 2004. This entry was posted in 2009 Memoirs. Bookmark the permalink.